DALLAS, TX–(Marketwired – Sep 13, 2016) – People Power, a services enablement company providing apps, cloud and mobile services for the Internet of Things (IoT), today announces Presence 360, the world’s first 360-degree smartphone security camera robot that reveals existing blind spots in home security. 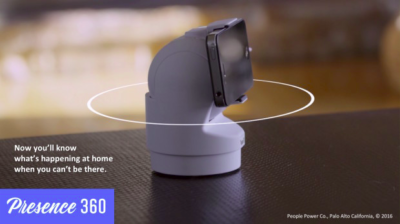 Presence 360 integrates with People Power’s free Presence app, which reimagines spare smart devices into remotely monitored video cameras and has already sent more than 80 million Presence Video Alerts worldwide. By downloading the Presence app on an unused smartphone and cradling that device in Presence 360’s adjustable arms, users can monitor their homes and loved ones in 360-degrees, control viewing angles remotely and automatically receive motion detected video alerts when they’re away from home. People Power will be demoing Presence 360 at the CEDIA Expo 2016, September 15-17, 2016, at booth 4171. Traditional security cameras are costly and only let you see a single static view, which leaves users blind to anything outside of the camera’s visual range. Presence 360’s full pan-and-tilt and 360-degree rotation allows users to look all around. Users can customize how long the camera remains at each vantage point too. Set Presence 360 to automatically pan to the front door for 15 seconds, the kitchen window or any other area of the home. Presence 360 cycles through those vantage points automatically to search for intruders or activity — recording video the instant motion is detected. When motion is detected, a Presence Video Alert of the activity is sent straight to the user’s smartphone as well as to their trusted circle of family and friends. The Presence Security Pack extends the value of Presence 360. It works through the Presence app and combines entry, motion, water, humidity, temperature and touch sensors to create a whole home monitoring solution. Also announced today is a significant performance increase to the Android version of Presence, which comes as a result of a conscientious refactoring of the popular mobile application. Android users will experience an increase in performance 3 times greater with the new version of Presence, available today in the Google Play Store. Presence 360 is compatible with iOS and Android smartphones. To pre-order Presence 360, visit https://www.indiegogo.com/projects/presence-360-smartphone-security-camera-robot-99-app#/. Dieser Eintrag wurde veröffentlicht in Crowdfunding, General, Hardware und verschlagwortet mit Camera, Robot, used phone von Sebastian Trella. Permanenter Link zum Eintrag.